I just bought this shirt in the store so I am not sure why it is not online. So I linked some similar ones. And this scarf has been sold out for a while. I have been trying to find a similar one to link but they are ALL sold out everywhere. So I linked some other plaid scarfs that I love. Lots of favorites in this post. I love all things plaid, which by now is no surprise. So double the plaid is even better! These paige jeans have been a long time favorite of mine. I linked the same jean just in a different wash. These are a staple in my wardrobe... And of course my red pumps that I am sure you all are sick of seeing by now because I have worn them to death over the past few months. I really got my moneys worth out of these! Red pumps go with so much more then you think! Love this plaid on plaid and it looks amazing with those heels! Love this combo! Great casual/cute look! i love this it reminds me of my ootd earlier this week where i wore a red scarf and i had plaid/flannelon! I love the two colors of plaid together...works so well! Both the shirt and scarf are so cool, and they look super fun together! i was lucky enough to grab this scarf before it sold out and i love it! i wear it faithfully! Love this look! Those shoes are so pretty! I love your blog! This outfit is do cute, perfect casual look! Super cute! Love this look and the red heels are amazing! Love that you did plaid on plaid! Loving the plaid on plaid and the accent shoes! Gorgeous! 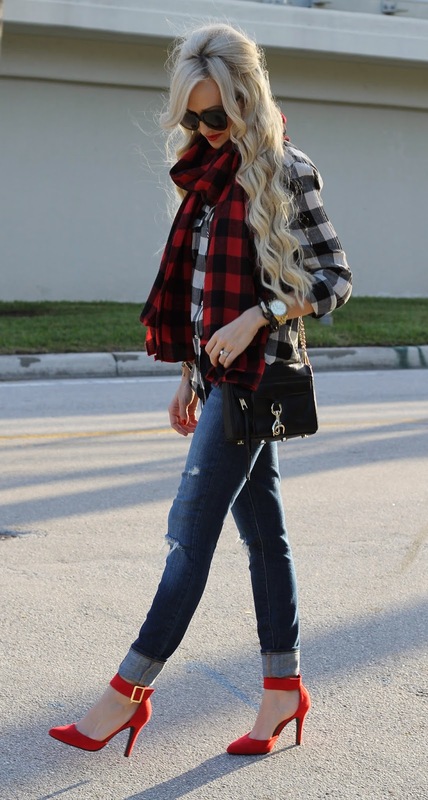 Love the double plaid! I can't seem to get enough right now. The red heels look great with this relaxed look! I love this outfit, the scarf is so cute! I love the shoes! I am obsessed with ankle straps right now. Looove the plaid on plaid action!